Marsha hit the headlines, not for the first time, when knocked down to Michael Vincent ‘M.V.’ Magnier, on behalf of Coolmore Stud, for £6,300,000 at the Tattersalls December Mares Sale at Newmarket in 2017. 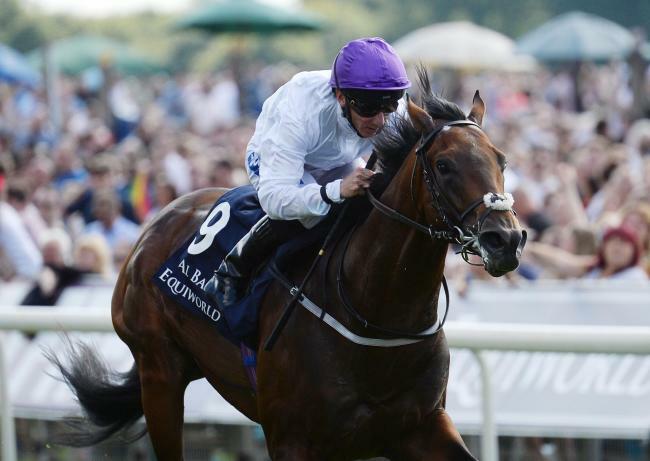 In so doing, the four-year-old filly became the most expensive thoroughbred ever sold at European public auction. 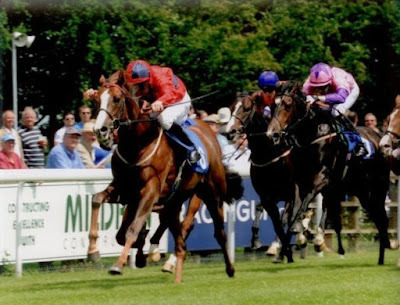 Bred and owned, during her racing career, by Elite Racing Club and trained by Sir Mark Prescott, Marsha won seven of her 18 starts and finished out of the first three just three times, accumulating a total of just over £650,000 in win and place prize money. Perhaps surprisingly, she won just three Group races, the Group One Prix de l’Abbaye de Longchamp – run, that year, at Chantilly – in 2016 and Group Three Palace House Stakes at Newmarket and Group One Nunthorpe Stakes at York in 2017. Of course, two of those are premier European sprint races, so to say that she ‘just’ won both of them is a little unfair. 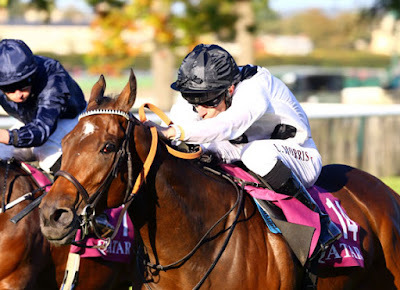 Nevertheless, her victory in the Prix de l’Abbaye de Longchamp, on the final start of her three-year-old campaign, was her first in a Group race of any kind. However, with another winter behind her, she gamely confirmed the form with the Chantilly runner-up, Washington DC, in the Palace House Stakes at Newmarket on her reappearance. Stepped back up to Group One level in the King’s Stand Stakes at Royal Ascot, for which she started favourite, Marsha kept on well in the closing stages, but could never threaten impressive winner Lady Aurelia and eventually finished third, beaten 3 lengths and a head. 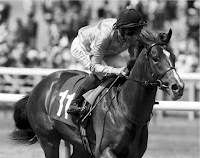 Marsha was subsequently beaten, albeit only by a short head, at odds of 1/2, by Caspian Prince in the Group Two Sapphire Stakes at the Curragh, and again, by Battaash and Profitable, in the Group Two King George Stakes at Goodwood. Consequently, when she lined up in the Nunthorpe Stakes – which again featured Lady Aurelia, Battaash and Profitable – three weeks later, he chance was less than obvious. As was her customary style, Lady Aurelia, ridden by Frankie Dettori, was quickly away and took the field along in the centre of the course. Indeed, when she quickened approaching the final furlong she had most of the 11-strong field in trouble. Not so Marsha, though, who tracked the leaders on the stands’ side and was driven to chase Lady Aurelia inside the final furlong, closing her down all the way to the finishing line. The two fillies flashed past the post together, with Dettori celebrating, finger aloft, but the ensuing photo-finish revealed that Marsha, ridden by Luke Morris, had got up to win by a nose. How Do You Bet on Grand National Day? Few race fans will forget the moment they watched Red Rum triumph to his third victory in 1977. 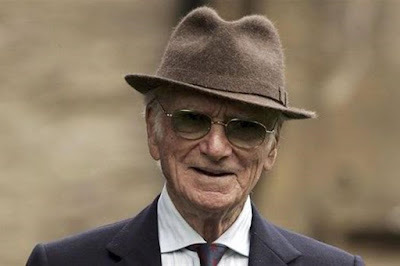 O'Sullevan was known as ''the voice of racing'' caught the honesty and truth of so many great races. Are you ready for the greatest steeplechase in the world? 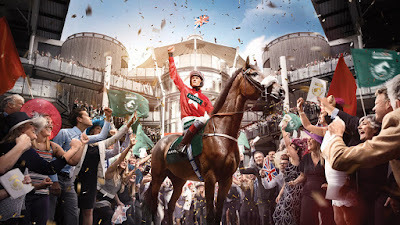 The Grand National 2019 will commence on 6th April 5:15pm. Another winner will add to the history of this great race which dates back to 1839 when a horse named Lottery won at odds of 5/1f. The National is a race where stories are made. In truth, funny, witty, honest, hard, gritty, tearful stories. Jumping over 30 fences and a distance of 4 miles 3 1/2 furlongs isn't for the faint-hearted. An interesting question (well, it might be). How do you bet on Grand National Day? True, the highest percentage of bets are placed by men. So talking about families it probably indicates dads. I have fond memories of my dad making his selection for the big race. Sitting at the table in the kitchen, often using a big magnifying glass to get that closer look at the form. I'm sure he backed Red Rum a few times. Always a quiet, studios man who enjoyed his racing. How I wish I could go back in time and chat with him about what tips he fancied. So often, dad's know best. This man knows his horses and he just loves to tell you his opinion (even if you don't really want it). If he could go back ten years you just know he'd be smoking John Player Specials. The font of all knowledge. He can tell you Red Rum won the Grand National on three occasions. Guess what? He's just about to give you this year's winner. So what is it you ask? He disappears faster than Mr Frisk. Love them or hate them you can guarantee if you work for a business or company someone will appear with The Grand National Sweepstake. Yay!!! Let's not give money to the bookmakers and we all put £1 in the hat and the winner of the race gets £40. 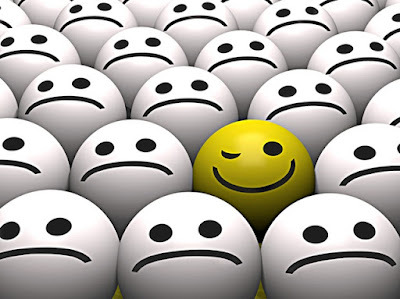 It's all good and well if you pick the favourite (so you think). But remember back to 1967 when Foinavon won at 100/1. I wonder how many winners of the sweepstake that year wish they had gone to the betting shop down the road. A lot of families love a kind of mini sweepstake where they pick ten horses each or just four and the money rolls over to the next year. 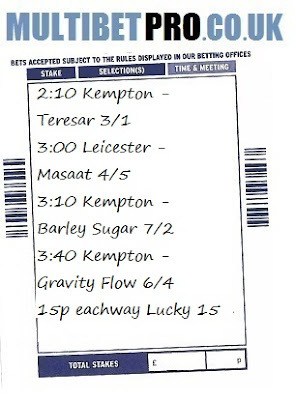 The Jacks family in Redcar have amassed a bank of £1000 pound since no winner has been tipped since Jerry in 1840. More of a generational sweepstake. 4) I Like That Name Or Colour! I often say knowledge is power. In most instances that is true. But, wait a minute, the Grand National isn't any ordinary race. Didn't that Captain Becher fall off his horse and swim in the water jump for six months until he was found by a punter walking his dog? OK, perhaps I added to the story. In general, this race defies comprehension. Five 100/1 winners! So, perhaps, that's the reason you should forget about form, betting or the advice of John McCrirrick. Let's just look down the list of runners and find a name we like! Perhaps the colour of those racing silks! His name is an anagram of Red Rum (known today as Mr Rude). He works for the local stable and sat on the horse last week. It motored up the gallops so swiftly that the owner added go-faster stripes to its flanks and they changed the riding hat for a motorbike helmet. Eyes on the prize as we enter the most exciting 2019 for The Pegasus World Cup race day on January 26 which has been trademarked to be the richest race of all time. Stornach Group, which is the brains of this international race event has seen great progress in just two short years and have thought on bringing in something new and exciting for all horse owners and the betting crowd. Aside from the 11/8 miles dirt race, they added 1 turf stakes to this year’s race-day activities. This 1 3/16 miles turf race aims to attract and showcase 12 of the best older turf horses from across the globe turning the 16 million dollar Pegasus World Cup Invitational into a Championship Invitational Series. The money on the bank keeps on coming as the Stornach Group will generously offer a million dollars as a bonus to the winners of both The Pegasus World Cup Invitational and The Pegasus World Cup Turf Invitational. It gets more exciting as they will also introduce a new wager, the Pegasus Pick 24, thats gives you a chance to bet on the exact finish order in both races where the lucky fan who hits the wager will take home the stake prize of $5 million. Crazy as it sounds to be, it is now foreseen that it will be an intense race day at the tracks of Gulfstream Park. Gulfstream has always been the venue of The World Pegasus Cup since day 1. This park has been open since 1939 when it orchestrated a 4-day meeting which has been a successful on with over 18,000 people on the bleachers for four days. 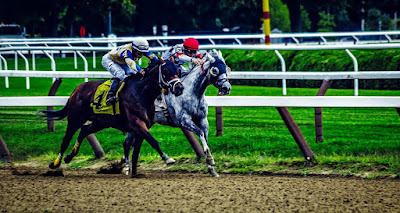 Other known races like the Florida Derby which was the major trial for the Kentucky Derby also run on the same tracks since 1952, the same year the clubhouse and the grandstand seating was expanded to accommodate the increasing number of audiences. The Pegasus World Cup which is a one of a kind thoroughbred race event has attracted not only the racing industries but also celebrities and fans all around the world. Expected contenders of the race will be the Horse of the Year of 2017 and one of the elite echelons of the sport, Arrogate and the 2018 young and also fast racer, Gun Runner. The live coverage of Pegasus World Cup--the most-awaited horse race of all time, which is provided by NBC sports will be streamed online through TVG.com. New players are advised to sign up for their account to avail their special offers and be ready to place their bets. TVG has also a full real-time race schedule and the live online coverage of any of their 150+ tracks such as Aqueduct, Arlington Park, Churchill Downs, Del Mar, Gulfstream, Golden Gate Fields, Keeneland, Monmouth Park, Santa Anita, Turf Paradise, Saratoga and many more. 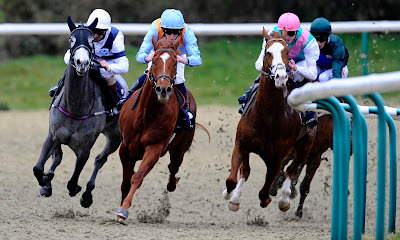 This online horse racing experts also provide a searchable list of all horse racing track lists, results and payout info from around the country and the world for the convenience of your betting scheme. TVG has been doing their services since the Pegasus World Cup started which is why it is known to be the only and the best outlet for you to place your bets online and legally. The will present you the listing of the ranked odds that will definitely help you decide to whom you will place your money on the pot. The odds for the Pegasus Cup will be determined on the night through a method known as Pari Mutual betting which actually means “amongst ourselves”. This is the best way to describe Advanced Deposit Wagering (ADW) which is the betting type of TVG. Common pools for each type of wager in a race are created by the amount bet on each horse or bet type. 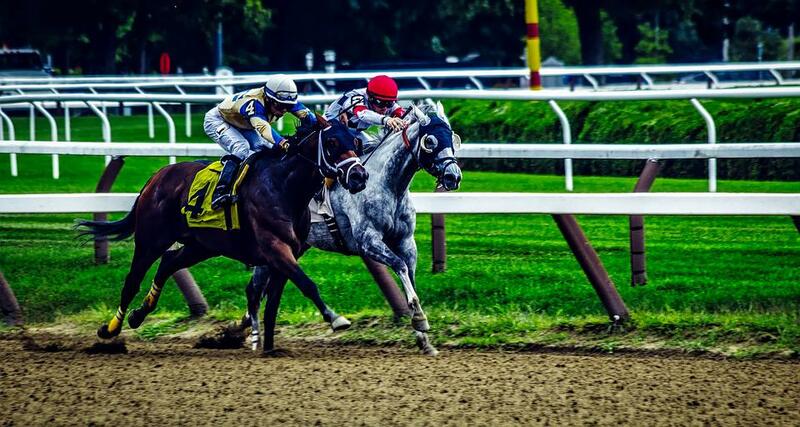 Essentially, a bet placed by a patron is wagering against all the other people betting on the race. The odds will fluctuate depending on how much money is wagered on each horse. In simple terms, the shorter the odds means the higher the racer get the bets and most likely known and will be the winner. Indeed, it will be an exciting 2019 for every racer and betting players of The Pegasus World Cup 2019. With its fast pacing progress, there is no doubt that it gets better and fiercer every year that would definitely make this richest race ever a legend. The Grand National is the biggest race in the UK, even more than the Cheltenham and Royal Ascot. This is the World Cup of hunt racing. Legends like Red Rum, Aldini, Hedgehunter and Party Politics have left their mark. Fans crowd the Aintree Racecourse just outside of Liverpool each year to see a race of 40 runners jumping over some of the toughest obstacles that a race of the kind offers. Favorites do not always win the Grand National, this is one of those races were selecting the winner is far more complicated. In 2017 One For Arthur snatched victory from major favorites. The Grand National is a National Hunt race, horses jump over 30 fences and pools during 3 laps over a course of 4 miles 514 yards. The race is one of the oldest in the world, it began in 1839 as a tradition between town folk that competed against each other between local landmarks. The racecourse was built over the same path the initial path, old stone walls and wooden fences have been replaced by the standard obstacles. Famous fences include The Chair, Becher’s Brook and the Canal Turn. The big race takes place the 14th at 5:15pm UK time. ITV channel will be airing the race. Get the latest Aintree Racecourse results and great odds live from William Hill, the contender list gets updated regularly with betting tips and latest news. Another post. Shock horror. Nothing horrible about our class information. 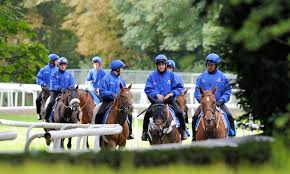 I will detail a few horses with a chance although they are to some extent more speculative than super confident. Sometimes you need a bit of luck. Something of a hit and hope here with Blue Battalion, trained by John Gallagher. Not really a trainer associated for debut winners - that may be the case today. This son of Cityscape is priced 25/1 so there is meat on the bone. May well drift out to huge odds. With these type of horses, you find they either win or lose badly. Still, for a small multibet may hold each-way claims at big odds. Looked horrendously slow. Either hopeless or injured. Very slow. Snail's pace. A fascinating if not an equally difficult race to assess. Why? Well, we have a good few horses here with ability if not big reputations. One of them may have a big reputation. East Coast Swing did little on debut but clearly held in some regard by connections. I would draw a line through that debut. A wide draw is far from ideal. It could be the difference between winning and losing, especially if pushed wide on the bend. There is nothing worse than struggling if not getting to the rail. At odds of 40/1, there may be some value although you may need to cross your fingers for some luck in running. The betting told the story. Very strange why this expensive buy holds significant entries and poor. May well show ability at three. A restricted race type. 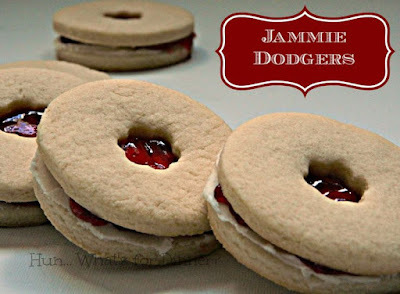 A couple of these may have more ability than looks. However, I am more interested in Minnelli trained by Philip McBride. This horse was expected to go well last time out but seemed to struggle with the early pace and slightly outpace. She ran on well in the closing stages and this trip will help. At odds of 10/1 looks to hold fair claims. Thankfully one of them run well. A battling performance to be headed and regain the lead. Enjoyable to watch after a couple of jokers in the pack. I haven't had an update on this website in a long time. Just don't have many opportunities for a multibet so it kind of makes this website redundant. Perhaps I should say dormant - because there is always the possibility of an eruption of bets. Anyway, I have three horses running tomorrow that may have a fair chance of going ok. I don't like to say anything beyond ok as I don't like to tempt fate. James Fanshawe's horse was fancied on debut and didn't show much - then disappointed the second start. There is a chance this two-year-old has the ability to go ok. At 20/1 is worth a speculative each-way bet. With these type of horses, they either win or unplaced so time will tell. Ran well, touching about 11/4 in-running and odds-on to be placed. Irritating it didn't get placed but can't complain. Clive Cox holds this horse in some regard. Has to take on a favourite who has a decent amount of ability even though the eternal bridesmaid (he is a colt). Venture is considered a fair juvenile who should hit the frame if those assumptions are correct. The drift outside 13/2 price guide didn't speak well. I would expect to see this horse do better in the future. Karl Burke must have been disappointed to see this $1000,000 filly struggle on debut. The odds-on shot proved something of an embarrassment for Spigott Lodge who must have been expecting a victory and news coverage for a positive start to her career. It didn't happen. Must go much better on the all-weather and I would be surprised it this filly isn't in the first three. Big drifter in the market but that's the difference between knowing something and not. Won easily. Yes, the number of bets is low. Nonexistent. It's not me - it's the horses. Sounds like you are waiting for the pun. I mean a different name which isn't so fixed. It leads you down the garden path to a gooseberry bush. Love. Betrayal. Conflict. Hope. Ambition. That's the word we need to dissect here. Horse racing. Is that one or two words. My spellchecker doesn't like it as two. So what am I to do with this website? 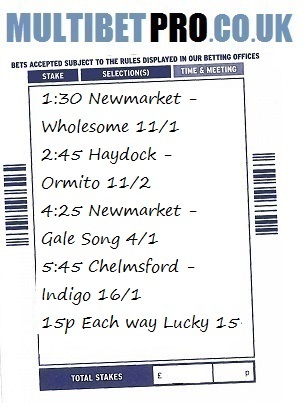 Sure there will be days when I have a few selections I rate and feel the need to detail them here. You know we know our stuff when it comes to two-year-old horses racing. We proved that with the limited number of tips given on these posts. Perhaps I should just forget about the website name and write whatever comes to mind. It would resolve the problem I have with writer's block. I'm never lost for words but if I don't have a decent bet to give I just can't bring myself to chew the fat. It just doesn't seem ethical. Even gamblers have ethics. Well, I do. I guess most gamblers are viewed as shady, cigar-smoking infidels. The kind of people who would rather take than give. I am far too generous. I guess I must have one of those souls which shines brightly in a darkened room. Who knows. I wish this website was called singlebetpro. A small profit yesterday with a first and two seconds. Just watching these as far from confident. 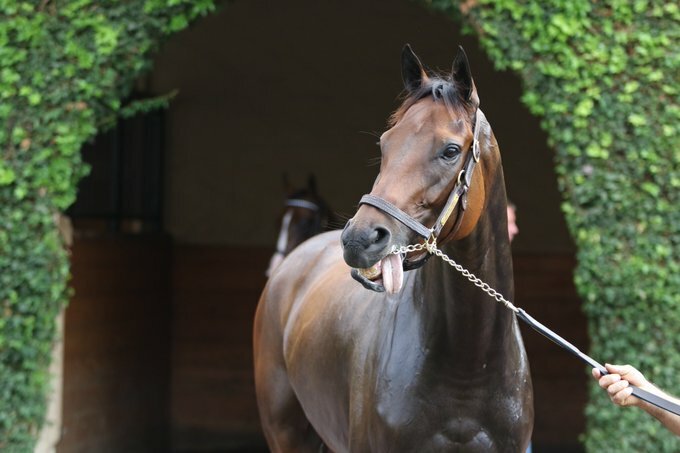 Oregon Gift changed stables after his recent win for Brian Ellison. This gelding is now with Charlie Man and top weight at this lowly level. Seems to have his own ideas when pulling to the front over 1m 4f and hanging on at the line. Not sure if this extra yardage will suit if exuberant. Time will tell. Archie Watson is a class trainer and Dutch Uncle has finished fourth and second respectively this season. This son of Dutch Art looks to be warming up and must have sound each-way claims. Hope there isn't a non runner as rather have three places than two. Esspeegee has been progressing nicely from a lowly level and still only rated 61 proving you don't need a high-class horses to have some fun and cover the costs. A number of canny wins have seen this five-year-old bay gelding rise in the official rating of 45. Alan Bailey must be satisfied with his handling of this Irish-bred son of Paco Boy who runs in the ownership of The Skills People Group Ltd. With these multiple winners, they can crash out at some point but there may be another win left in this horse. So we start today with Thursday's Multibet - three random horses which we hope get lucky. Hoping Michael Easterby's five-year-old can at least hit the frame after winning last time out. Saeed bin Suroor has a decent filly here and although she needs to defy a win penalty should go round about with future plans being penciled in. A desperate-looking handicap. Rebecca Bastiman has a few hopes on the card and this chestnut son of Assertive has claims of hitting the frame. However, there are plenty of gamblers who fancy they can win a fortune with a small bet. It might be a remote chance but it can and does happen on a daily basis. We've all seen the stories where some lucky bleeder wins a few hundred grand for a bet that cost less than a cup of coffee. Whether they were wise or just jammy they placed their bet and it changed their life for good. I guess every punter has that dream. Who is to say it won't be you who tastes the sweet success sooner rather than later. Multibetpro is back with a difference. We know to win big you need to get lucky. We're not going all scientific here. I'm a man with a rabbit's foot tied to a horseshoe. If I had a middle name it would be Lucky. This website is all about random selections. I know it seems a brainless concept but can pure, random luck beat the experts who think they know best? It seems unlikely, misjudged, haphazard if not a little insane. But that's what this website is all about - chancing your luck. In addition to the multibets, we will detail stories of big winners across the board of gambling: lotto, football, slots, casino, horse racing, greyhounds... Every big winner has a story to tell and we will revisit the stories of those who hit the jackpot. I will be detailing a few multibets. In general, they go well. 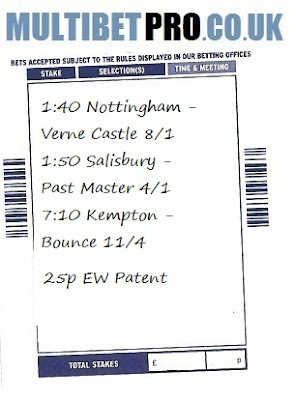 Always a fine line between a terrible and great day on these bets but that's the nature of the beast. If we get a few readers, share and people taking an interest it may inspire me to detail more. Poor effort in ways. Snow Squaw was irritating not getting a place (2 places). Rita's Girl was heavily backed to 13/2 but didn't do as expected. Fire Brigade had good reason to go well on my info but didn't. Used To Be done well to hang on for a place. An EBF Novice Stakes over 6f 16y on soft going. Nine two-year-olds competing at this idiosyncratic racecourse. Seven juveniles have race experience, all colts bar one gelding. The betting suggests this is a three-horse race and a couple of major protagonists have raced against each other over course and distance although on markedly different going. One big hope is Eve Johnson Houghton's Hedging. Place bet on William Hill because this horse has strong claims. This Irish-bred son of Mastercraftsman looks a very good yearling purchase at just 8,500G, acquired by the trainer. This grey/roan colt is owned by The Picnic Partnership. Hedging was priced 16/1 on debut, backed from 25/1. He needed the experience on his racecourse debut and after a slow start ran on well in the closing stages under the handling of 5lb apprentice Edward Greatrex. He finished less than one length behind Sterling Silva who has proven a durable two-year-old for Richard Hannon and Middleham Park Racing. The form of that race looks fair. You always have to be careful with horses which finish with verve, to make sure they are not flattered, chasing home tiring horses. It can often be difficult to assess this fact and it should be noted the going that day was said to be good to firm but the time was over four seconds slow. Johnson Houghton has been pretty quiet this season with a small string of two-year-olds hitting the tracks. The stable have a few debut winners but these usually turn out to be talents, while most run well on their second start. Connection have done well another horse readers may have followed. Room Key [pictured] won on debut, which has been his only victory to date but raced at the highest levels, placed at Group class, even contesting group 1. Hedging will need to be something special to emulate the successes of Room Key but he has plenty of time to improve on his initial start. He faces his old rival Bazwind, trained by David Evans, who was less than one length behind at Chepstow. He ran at Leicester on his second start where conditions were heavy. I would imagine that going was a little too testing and this course and going will be more suiting. However, I do feel that Hedging holds an edge over this colt. Other live contenders include Andrew Balding's Stag Party. The stable do well at this course and interesting to see Edward Greatrex riding as he has done well with the few juveniles he has ridden for Kingsclere. One horse that may go well at a price is Richard Hannon's Restore. This Irish-bred son of Dark Angel cost 55,000G at the yearling sales and showed promise on debut in what has turned out to be a hot race. He wasn't suited by dropping back to the minimum trip at Bath and simply run off his feet. With the claim of a 5lb apprentice, he could slip under the radar and at odds of 20/1 may hold some value. Conclusion: Hedging looks to have a good chance of winning here although priced 11/8 doesn't give a great deal of value. I would be tempted to have a small each-way bet on Restore at huge odds. Considering the bet, it might be best - if not an alternative - to have an ew patent without Mootaharer. White Poppy 4/1 4th - don't like to be critical, but a poor ride. Should have pressed on much earlier. Dashing Approach ideally needs to be priced 10/1 & less SP. Marsha has a decent level of ability. Haughmond was well regarded early season but has not lived up to expectation but is lowly weighted for this nursery. Worth a bet in hope of running a race. The favourites are the strength and the two 10/1 shots we may need to get a bit lucky. 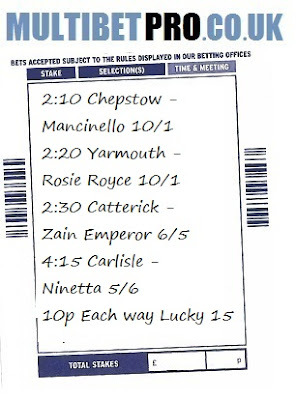 Can't quite work out Rosie Royce but she may be good enough to hit the frame and beyond that fingers crossed. Mancinello is noted but to be a strong each way chance needs to be backed. It may well be backed and taking 10/1 could be a good move. Hope that happens and all hit the frame at least. Sorry for slow update, been on holiday.